Today was an incredibly heart opening day for all of us. The day began with a short visit to the Memorial Chorten in the capital city of Thimpu. This large Tibetan-style chorten is one of the most visible religious structures in Thimphu, and for many Bhutanese it is the focus of their daily worship. It was built in 1974 as a memorial to the third king, Jigme Dorji Wangchuck (1928–72), who is popularly regarded as Father of Modern Bhutan. 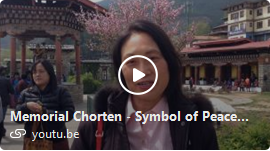 It was the late King’s wish to build such a chorten to represent the mind of the Buddha and dedicated to world peace. The whitewashed chorten, with its sun-catching golden finial, is decorated with richly painted annexes facing the cardinal directions, and features elaborate mandalas, statues and a shrine dedicated to the popular king. 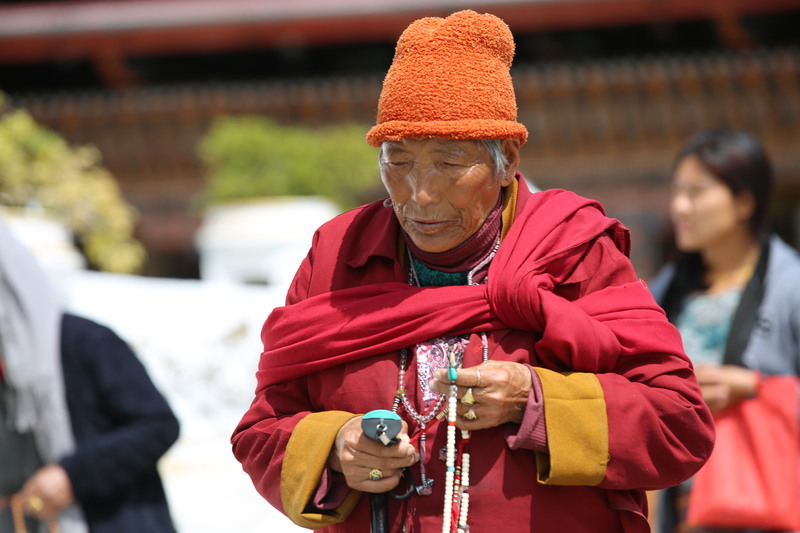 Every day from dawn till dusk old people and young alike circumambulate the chorten turning the large red prayer wheels, or chanting with their mala prayer beads or mini handheld prayer wheels. We walked into the sacred prayer grounds towards the chorten with a feeling of the greatest tranquility. Hundreds of monks, nuns and people from all walks of life in Bhutan walk in circles around the chorten with prayer wheels and rosary beads chanting Om Mani Padme Hum, unified in prayer and service to all sentient beings. It is believed that spinning the prayer wheels repeatedly inscribed with Buddhist mantras in a clockwise direction releases prayers to heaven. According to Tibetan Buddhist belief, spinning a prayer wheel is just as effective as reciting the sacred texts aloud. This enables the individual to become awakened and realize the Four Immeasurables of Love, Compassion, Joy and Equanimity, thus assisting their journeys to enlightenment. My heart opened deeply as living proof of this nations compassion and love for service to all sentient beings was before my eyes. Located beside the entrance are room size giant prayer wheels. A prayer wheel is a spiritual tool for widely distributing loving, compassionate and kind blessings with your positive wishes for yourself, all those you care for, as well as all sentient beings. Every day throughout the year dedicated devotees activate prayer wheels by turning them clockwise. I found that there was something completely peaceful, completely centering, completely healing about turning prayer wheels. Prayer wheels are inscribed with the Buddhist compassion mantra, Om Mani Padme Hum, on the outside of the wheel, and it is this mantra that facilitates the blessings and wishes. We walked to a small sacred shrine and lit beautiful butter-lamps feeling the deepest privilege and honor. Throughout our travels within Bhutan we were greeted by prayer flags and prayers wheels all over the city. Placed strategically and often within walking distances of each other the prayer flags and wheels are gentle but consistent reminders of the purpose of life – Service to all beings! This humbling education in the lifestyle, tradition and rich heritage of Bhutan will remain our constant guide and inspiration as we continue our travels and service. We journey to the office of the Tarayana Foundation continuing our education of this glorious land of the thunder dragon and the service of our very valued partner. Sonan Pem, Director Programmes for Tarayana Foundation warmly greeted, we sat down to an eye opening and heart touching presentation about Tarayana’s projects with remote communities and vulnerable individuals. She regaled us with beautiful stories of hiking for up to 6 day just to be able to reach a community so Tarayana could serve them well. Sonam has been with Tarayana Foundation since 2005, with 11 years of dedicated service behind her she was deftly able to take us through the various programs and schemes. Social Development Programs consist of programs for vulnerability reduction, scholarship and learning opportunities and green technologies. Vulnerability Reduction focuses on building capacities within communities as well housing improvements, surgical camps and more. Economic Development Programs include micro-financing schemes which support economically disadvantaged individuals access targeted loans to start, sustain, or expand small-scale business as well as programs for local artisans to sell their arts and crafts to Tarayana Foundation for fair prices and more. Sonam spoke with gentle sincerity about their Women’s economic empowerment & livelihood activities as well as Early Childhood Care Development (ECCD) programs. Click here to read more about several excellent initiatives of the Tarayana Foundation. 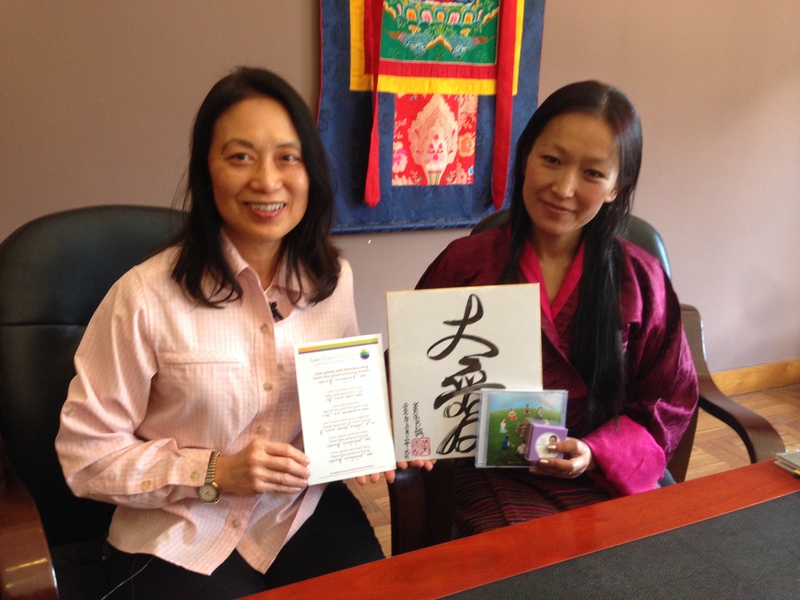 She was delighted and moved with the opportunity presented by the Love Peace Harmony Foundation team to teach basic self-healing, the Four Power Techniques, Love Peace Harmony chanting and Tao Calligraphy. Complimenting and supporting these important lifestyle improvement tools are the life saving vitamins for 500 children and mothers. 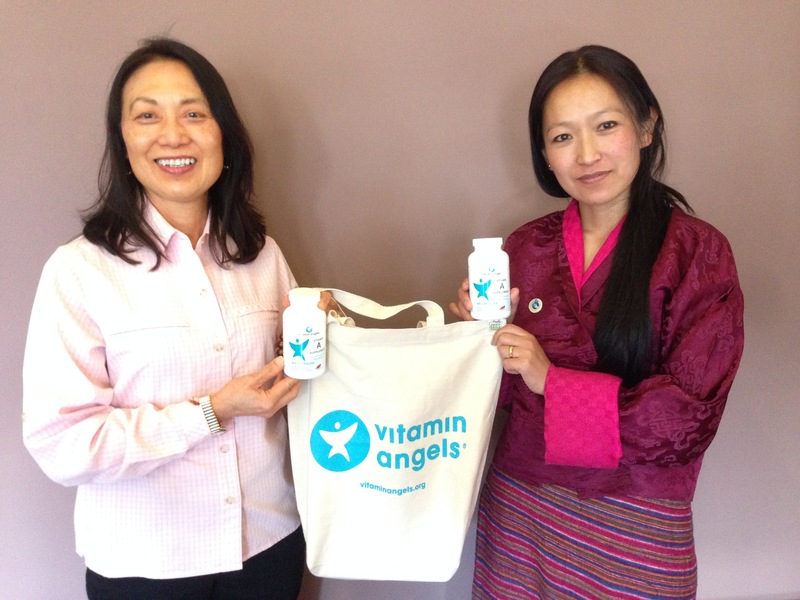 Love Peace Harmony foundation collaborated with Vitamin Angels to bring Vitamin A, deworming tablets and vitamins for lactating mothers. All fundamentally important for the nourishment and safety of mothers and children. Sonam spoke animatedly about the process of offering these vitamins to children and mothers through their ECCD centres established in many vulnerable communities. 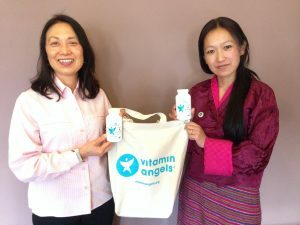 The Love Peace Harmony Foundation team was equally excited at the opportunity to administer these vitamins themselves to the 200 children we are preparing to visit very soon! 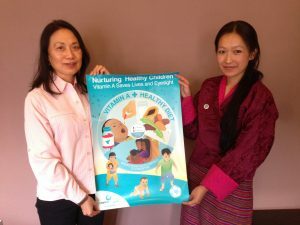 Day 2 continued for us with an incredibly heart touching meeting with Tashi Zangmo, founder of Bhutan Nuns Foundation, a visit to Tarayana Arts and Crafts outlet for marketing good produced by local artisans and our education in peaceful living with a visit to the worlds largest Buddha! Stay tuned for more in the next blog. Bhutan culture! Have a blessed & safe journey! Thank you again for your sharing! Spiritual power aligning with physical power to help keep happy and healthy body. similar to Master Sha teachings, Shen – Soul, Heart, Mind(consciousness), Chi – Energy, Jing – Matter, He Yi – Join as one. Shen Chi Jing He Yi – Soul Heart MInd Energy Matter Join as one, and the enrich feeling of soulfulness is experienced, and makes everyone a believer of faith.